Conference Schedule has now been posted! Planning to attend? Parking & Navigating Campus information can be found here. Join us for the Personal Digital Archiving annual conference in Houston, TX. Hosted by the University of Houston Libraries, the conference will consist of presentations, panel discussions, poster presentations, and hands-on workshops. A diverse selection of topics has been presented at previous conferences, including: presentations about family history projects and community photo preservation; best practices and discussion about library/archive management of born-digital items; community-based history and event archiving on social media; and so much more (see previous conference pages, below). For requests or questions, contact Melody Condron at macondron@uh.edu. If you are staying in the Hilton on campus parking will be free in the Hilton garage. Parking in the Welcome Center garage costs $9 a day. Both garages are marked on the above map. 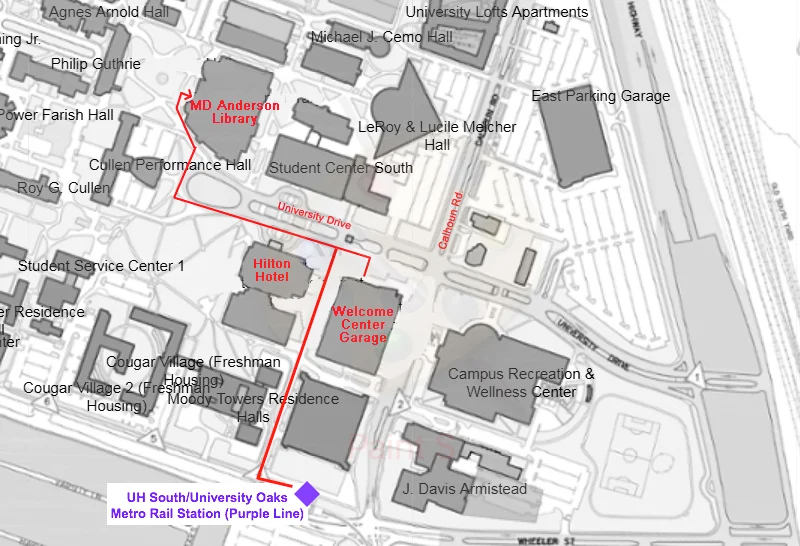 If you are staying off-campus, you can use a car service (Lyft & Uber are both active in Houston), or you can take the Metro Rail to the UH South/University Oaks rail stop, marked on the map above.